Interview über sein Projekt auf einer Verkehrsinsel in Sharjah in Zusammenarbeit mit Gärtnern aus Pakistan. For the Sharjah Biennial 2017, he has conceived the long-term project "Beej", activating a potential for farming in the municipal workforce, largely from Pakistan, who tend to Sharjah’s landscaping. Two gardeners travelled home to bring vegetable and grain seeds from their family farms in Lahore and Punjab. Along with others in the community, they will sow the seeds in a roundabout in the Al Naba’ah residential neighbourhood of Sharjah. Haupt & Binder: How did you get to know these gardeners you are working with? Vikram Divecha: In 2015 I did a project in Sharjah with five municipal gardeners who were responsible for maintaining Al Majaz Park. After the lengthy process of receiving due permissions from the municipal authorities they joined me for a project to redesign hedges at the park. We spent almost three months doing drawing workshops to come up with hedge designs, some of which were inspired by their own vernacular traditions. Over the next few months they implemented their designs on a hundred meter hedge wall at Al Majaz Park. Alongside, some of their sketches and hedge trimmings from the park were exhibited at the gallery at Maraya Art Center, in Al Qasba. During those 7-8 months I got to know them better, while they became familiar with the way I work as well. Initially I was mistaken for a landscaping contractor, but with time they grasped my endeavors as an artist. Most of the gardeners working in Sharjah municipality are from Pakistan with a well-rooted background in Farming. One of the questions I took back from my engagement with the gardeners was the relationship they shared between the urban land that they work on here, and the land that they have left behind in Pakistan. Farming is native to them, and most have honed their skills since childhood. You could notice it in the way they spoke about the weather, temperature, soil and the land - they gauged these elements in a particularly tactile manner. It came across as some form of inherent knowledge. Haupt & Binder: At what point did you initiate the project? Vikram Divecha: Activating this capacity for farming was on my mind since 2015, and I had been in conversation about this with the gardeners, Maraya Art Center and the municipality. Eventually, the Sharjah Biennial was the platform to instigate and facilitate this farming project. A new set of questions arose as I began to engage with SB13 curator Christine Tohmé on one hand, and the gardeners on the other. Somewhere I became a mediator between these two disparate entities. And while this work on face value had a very site-specific context, it was gathering a lot more weight as to what it would eventually mean to these men who will till the land. Haupt & Binder: Why did you decide to take a roundabout as a site for farming? Vikram Divecha: The roundabout was essential to this project, as it is a site of convening and dispersal, and a site of circulation, which thinks about the harvest seasons. As an island, it remains isolated which symbolizes the dislocated communities, and the professions that are left behind due to migration. Inherited from colonial systems, roundabouts are designed to regulate traffic. Introducing an intervention within this very structure of control was an interesting layer. 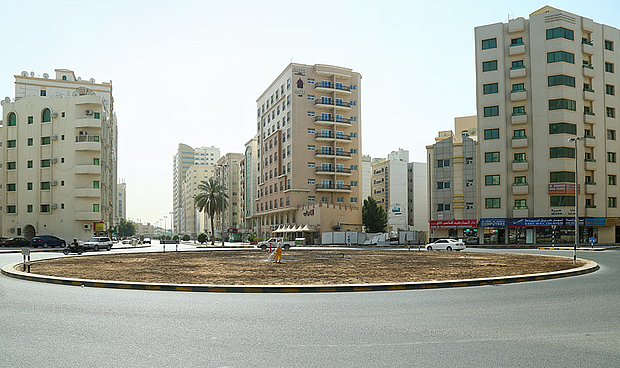 With the help of Municipality I found a roundabout that was not landscaped, in Sharjah's Al Naba’ah residential neighborhood. It’s a quiet place without constantly circling traffic. At about 40 m in diameter, it is a sizeable roundabout, of course not so much for farming, but some of the gardener's family farms might not be larger. 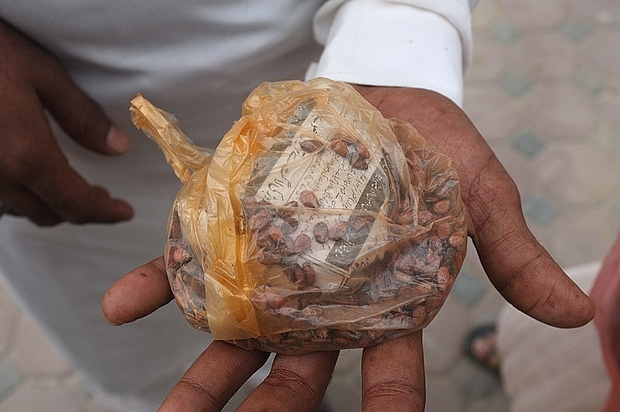 Haupt & Binder: How necessary was it to bring back seeds from Pakistan? Vikram Divecha: From the very go it was clear between the gardeners and myself that one of the main purposes is to bring back seeds from their villages to Sharjah. It would definitely have an affective value that would bring more investment to the project. The status of unregistered seeds as a metaphor of their own migratory status was a thought that started brewing amongst us. The project is titled Beej, which means "seeds" in Urdu – a term that came to surface from my conversations with the gardeners. To set things rolling I invited two gardeners (Sajad and Saleem) to fly home to their respective villages in Pakistan to bring back to Sharjah vegetable and grain seeds that their family farms would hold store for the next harvesting season. Saleem also carried back seeds from the family of another gardener (Shabbir) who could not make the trip. Haupt & Binder: What has been the greatest challenge so far? 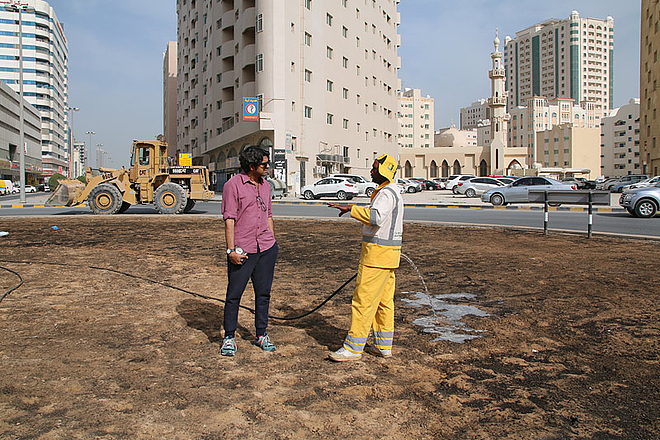 Vikram Divecha: While preparing the roundabout in February/March 2017, after having removed the sand and gravel and replaced it with soil with compost and manure, we were using treated sewage water which is what is used for landscaping in Sharjah. But when we start sowing the seeds we would definitely need sweet water, which was not available at the site. So, that's why this project has slowed down because of the negotiations with the Municipality in order to get sweet water. We now have permissions to dig the road and connect a sweet water pipe, and place a tank at the roundabout. Maraya Art Centre is now supporting the project, as well. The gardeners are looking forward to sow seeds in the tenth month, or October. Haupt & Binder: How do you envision the future of this project? Vikram Divecha: I really like this site because of this neighborhood. I've seen people walking around this periphery, or walking through, but in fact the Municipality has the concern that the people might pick up the produce, and I think that is exactly what I want, I don't want to be territorial about this. On the other hand, the gardeners would like to own the produce, as one of them was saying, that they could just possibly go and sell it here in the local market. But they understand that the work isn't about "claiming", so they will be open to it. They actually live in community, they live in rooms where they share meals, there is some sense of sharing which is always there, but of course they would want to take back something home. At the same time they understand that there is a level of exhibition in this, there is also a kind of aesthetic that they want to bring into this site. So I think my job, or my effort is to cultivate a certain attachment, a certain investment towards this from the gardener's side, and I imagine that the question would be what is the relationship with this site in the future. Hopefully what is going to happen is that the produce from the fruits, vegetables and greens, and the seeds themselves, will be an invisible chapter of how they get disseminated into the city. Vikram Divecha interviewt von Gerhard Haupt & Pat Binder, Herausgeber von Universes in Universe - Welten der Kunst. Zu den beteiligten Gärtnern gehören Sajad Hussain Bughio, Muhammad Saleem Manzoor Ahmed und Muhammad Shabbir Ahmad Din. Die visuelle Tour durch die Ausstellung in Sharjah zeigt Werke aller Teilnehmer mit Texten aus dem SB13 Guide Book sowie Informationen zu den Orten. 10. März - 12. Juni 2017. Kuratorin: Christine Tohmé.